The Third Battle of Ypres, or the Battle of Passchendaele as it is sometimes called, has become synonymous with one thing, mud. Most of the battle would be fought in situations that seem completely impossible, and yet the British army persisted in the attack. Of course, attacking through mud that would literally swallow a man, or a horse, was not the plan from the beginning, and while the mud would raise its brutal head by August, when the battle began in July the situation was far closer to ideal. The goals of the attack were, much like previous British attacks, lofty, with hundreds of square miles of Belgium to be captured, and maybe even the war decisively changed. To accomplish these goals the British would assemble thousands of artillery guns, on a length of front that was just 15 miles wide, resulting in double the density of the artillery that had been unleashed on the Somme, and they would fire 4 million rounds of ammunition before the infantry even took one step forward, or at least tried to. The Third Battle of Ypres, or the Battle of Passchendaele as it is sometimes called, has become synonymous with one thing, mud. Most of the battle would be fought in situations that seem completely impossible, and yet the British army persisted in the attack. Of course, attacking through mud that would literally swallow a man, or a horse, was not the plan from the beginning, and while the mud would raise its brutal head by August, when the battle began in July the situation was far closer to ideal. The goals of the attack were, much like previous British attacks, lofty, with hundreds of square miles of Belgium to be captured, and maybe even the war decisively changed. To accomplish these goals the British would assemble thousands of artillery guns, on a length of front that was just 15 miles wide, resulting in double the density of the artillery that had been unleashed on the Somme, and they would fire 4 million rounds of ammunition before the infantry even took one step forward, or at least tried to. When weighed against the objectives the attack would be a monumental failure, and it would certainly be remembered as such, but after the campaign was over, and especially after the war, the question became who should be blamed, somebody had to have made a mistake right? How could such a disaster have happened if somebody had not royally screwed up? The participants at the time generally either shuffled blame, like Lloyd George would do, or would claim that the offensive was accomplishing the goal of killing Germans, which Haig would do. Lloyd George, who in 1917 was at the head of the British government would defend his position after the war and in a 1932 interview with Liddell Hart he would say that he did not believe he could put a stop to the offensive because, if he had, he would have been blamed for spoiling the chance for a decisive British success. On his side Haig would also claim that the lengthy set of attacks were necessary due to the state of the French army, which had experienced mutinies in the early summer of 1917 and were still recovering in July. After the war historians have had varying explanations and evolving opinions about the battle itself. Modern scholarship has come a long way from the Lions Led by Donkeys myth that was so persistent for most of the 20th century, but even for many revisionist historians Passchendaele does not get high marks. Even if you want to have a positive outlook on the battle the mud, the clinging, suffocating, bottomless morass of misery that is so prevalent in first had accounts is hard to ignore. Over the course of the next several hours we will be telling the story of this battle. I encourage everyone to try and go into our story with a mind free of preconceptions. We will take our time as we look at not just what happened on the battlefield between July 31st and November 10th, but also how the entire story began, what the British hoped to achieve, how entire sections of the plans did not even happen, we will then move on to how both the British and the Germans reacted to the reality of the situation after the battle began. Our story today begins about as far away from the mud of 1917 Flanders as you can imagine, because it begins way back in 1914, when the germ of the plans for 1917 began. As with all large military efforts there were many goals for the offensive, which would be the largest in British history, and those goals began with no mention of Passchendaele, and no concern for places like Messines, Gheluvelt, Langemarck, or the Menin Road, all of that would come later. For two years all of the planning for an attack in Flanders revolved around one thing, the capture of the Belgian channel ports. The plans would at various times call for the largest amphibious assualt in history, and it would be considered more important than the attack at Ypres, in fact the attack at Ypres was just a setup for the amphibious attack. Some of you may know a good amount about the history of the war, and right now maybe you are searching your memory about this amphibious landing, and if you do not remember it that is just fine, because it never happened. But how it came about, and why, and then the reasons that it never actually happened are critical to understanding why 450,000 British and German soldiers were killed, wounded, or went missing in the mud of Flanders in late 1917. And so, we begin our story in August 1914, with the Germans having pushed through Belgium on their way to the Marne, and in the process having captured the Belgian ports of Ostend and Zeebrugge. Right from the start of the war the Royal Navy was involved in the defense of Beglium. There was even a unit of a Naval Infantry Division landed at Antwerp before it fell to the German Army. While there was some level of compassion felt for the Belgians which led to these British efforts to save the country there was also the more important matter of the Belgian channel ports. The two most important of these were Ostend and Zeebrugge, both of which were top of mind for the Royal Navy. The concern was that if the Germans had access to these ports, they could then use them to restrict British access to the English channel, and therefore control sea traffic to the continent, a situation that would greatly hinder British military efforts in France and Belgium. In fact the Germans would base several submarines and destroyer squadrons out of these ports, so the Royal Navy's concerns were somewhat warranted. In late 1914 and early 1915 this situation resulted in many discussions about a way for the Royal navy to reduce the effectiveness of the ports for the Germans. Generally this involved landing some troops at one or both ports to try and sabotage them in some way. These discussions never really progrssed far due to the effect that the Gallipoli operation would have on monopolizing Royal Navy resources and also reducing their confidence in amphibious landings. With any British reponse delayed out of early 1915 the Germans continued to improve, expand, and fortify the port facilities to make them more useful, but also less vulnerable to British attack. This fortification came mostly in the form of shore based guns, in well fortified positions, which would be capable of beating off any British ships that came too close, or at least making them pay very heavily. The growth in the capacity and defenses of the ports would cause the British to have to reevaluate any efforts at attacking them. But they still had to think about it, especially as the German U-Boat threat continued to increase as the war continued, eventually coming to a climax in early 1917. February to July 1917 were some of the best months ever for the German U-Boats and the British were desperate for something, anything, that could slow down the sinkings. This desperation put a certain urgency in the efforts to neutralize the Belgian ports that would help propel the amphibious operation forward. Before detailed planning would occur there were a few requirements that everybody on the British side would agree upon. The first was that it was impractical to try and land troops from the sea unless there was a significant success by the army. In their dreams they hoped for a true breakthrough of the front, something that was still believed to be possible in 1915, but it would be at least enough to have a decent success so that the Germans would be forced to concentrate their reserves against it instead of being able to throw them against the landings. It was then also believed that the land attack would have to happen somewhere near the coast because the two efforts had to be mutually supporting, if it was too far south the effects of the two attacks could be isolated and dealt with separately. This requirement significantly narrowed the scope of where the British could attack. While the two attacks would support each other, and maybe eventually meet up, they also had to be self-supporting. This resulted in the naval attack not being considered just a subsidiary or secondary attack, even though Haig would at times consider it as such. The men in charge of the naval operation both from a planning and execution perspective considered it a full primary operation with its own goals, problems, and solutions separate of those of the land action. 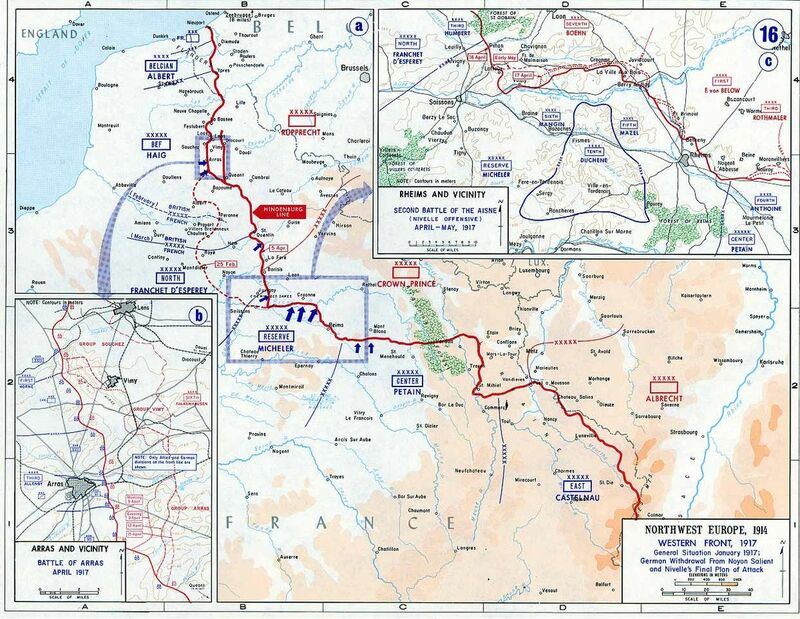 The final requirement was that, since the British did not know exactly when the landing would happen it would have to be able to adapt to the situation on the continent, causing several iterations of the plan which changed both small and large details of the operation from its initial inception in late 1915 to its possible implementation in late 1917. The first detailed planning was done in November 1915, at a time when Sir John French was still in command of the BEF. The goals for these early plans were somewhat limited and based around the desire to neutralize Ostend, but not to actually capture the city itself. These limited goals were primarily driven by the lack of available resources, since this was before the BEF really began to expand in mid 1916. The first step of this early plan was the neutralization of the German shore batteries through naval bombardment and from long range British artillery near the Belgian town of Neiuport. Once this neutralization had occurred the landing would take place, hopefully with complete surprise, with beaches chosen from Neiuport to at least Middelkerke, about halfway between Nieuport and Ostend. If the landings were successful it would would achieve two important goals. First it woudl keep Nieuport, and its harbor, safe from German artillery bombardment which would let the British use its facilities free of harrassment. Second, it would allow the British artillery to shell Ostend, essentially putting it out of action as a base for the Germans. When Haig took over command of the BEF in 1915 he supported the planned operation. He liked the idea because it provided the British with a way of possibly turning the German right flank with a relatively small material outlay and risk. There was certainly a risk of the seaborn landing being a failure, but that was considered acceptable given its small scope. Since he liked the initial plans, Haig brought in Vice Admiral Sir Reginald Bacon, the commander of the Dover Patrol, to do some more detailed planning. Bacon was a critical player in any possible attack since his naval forces would be the ones executing any naval part of the plan. From when he began his work in January 1916 Bacon would see the entire planning and possible execution through all the way to the end of 197. From January to March 1916 Bacon would develop his plans. It seems that Haig originally wanted a plan that looked very similar to the 1915 version, with an attack along the coast to go along with the seaborn landings, but Haig's mindset changed over the course of early 1916. This can be seen in his request that General Rawlinson, then in command of the front that included Ypres, to develop a plan for an attack out of the salient and towards Roulers to be followed by another attack on the coast from Neiuport. A key point of this plan is that Haig did not tell Rawlinson about the possibility of a naval landing to assist the attack on the coast, he wanted to keep it secret since surprise in the operation was essential to its success. Bacon would complete his planning in March and this first iteration of his plan would require 6 monitors for shore bombardment, 100 trawlers for troop transport, and 9,000 men to go ashore. These would be from the 1st Division, with 2 more divisions needed to reinforce and follwo up on the initial attack. These would only be landed in Ostend itself after a lengthy series of bombardments all along the coast to confuse the Germans about where precisely the attack would take place. The infantry would then hold Ostend until they were met by an attack that would be launched simultaneously by troops advancing along the coast from Neiuport. If everything was successful, and secrecy maintained, the Germans would be caught off guard and unable to respond. After receiving these plans Haig would bring in General Hunter-Weston to get his opinions on Bacon's Plan. Hunter-Weston had commanded a division at Gallipoli and as such he was probably as close as the British had to an amphibious landing expert at this time. After evaluating Bacons plan and all of the available information about the coast and the German defenses Hunter-Weston would have 4 primary concerns about the operation, I will list out all of these because they will greatly inform the evolution of the planning that would result in the final plans for 1917. His first concern was that if the British just landed at Ostend they would not have a wide enough front to ensure success, and they ran the risk of being isolated on too narrow of a front by the Germans. Second, he believed that the German shore artillery, which continued to increase in number and capability, would pose a serious problem that woudl not be easily neutralized. Third ,when evaluating the available roads out of the Ostend harbor, and their locations, he was concerned about the fact that they went through heavily populated areas, which were always easy to defend and easy for an attacking army to get caught up in. Hunter-Weston's fourth and final concern was that he believed that the Germans had probably fortified the piers at Ostend to prevent an easy British landing, they would be idiots to not do this, and so far in the war the Germans had proven that they were not idiots. With this feedback in hadn Bacon would reconsider many of his base assumptions, including his belief that the troops should be put ashore in the city of Ostend itself. While Bacon would reformulate his plans any possible time pressure would be removed by the actions at Verdun and the Somme. These events would consume all French and then British resources for 1916, leaving nothing for possible operations in Flanders. While the plans were put on hiatus, Haig still hoped to execute the operation in the future, and he knew that any future operations would be dependent on gaining and then maintaining government support. Of all of the operations that the British planned for 1916 and 1917 the neutralization of the Belgian ports was probably the easiest to gain this support. The civilian government was under a tremendous amount of pressure from the country at large to do something about the U-Boat threat, with Asquith even writing that "There is no operation of war to which the war Committee would attach greater importance than the successful occupation, or at least the depreivation to the enemy, of Ostend and especially Zeebrugge." He wrote this in late 1916, and if anything the operations became even more important in early 1917 with the rising threat from the U-Boats after they began unrestricted submarine warfare again. The government knew that any action that reduced the effectiveness of the U-Boats would be a huge propaganda victory, even if it did not appreciably reduce the number of U-Boats patrolling the oceans. It is important to note that most of the Germans submarines that were harassing shipping in the Atlantic were based out of German ports, not Belgian ones, and the only submarines at Ostend and Zeebrugge were smaller mine laying varieties and while these caused a great amount of havoc near the British coast and in the English Channel they were not necessarily the most impactful to the British war effort. But from a public perspective a U-boat was a U-boat. With support easily gained for the operation Haig would begin 1917 planning discussions with the French by once again pushing for operations in Flanders involving both the amphibious landing and the attack out of Ypres. Thsi was some support for this effort from Joffre, but then the entire situation once again changed when Nivelle was brought in to lead the French army. Nivelle had his own plans and wanted to launch his attack on the Chemin des Dames, which if successful might then allow the French to assist the British in Flanders. With at least some amount of support from the French, Haig continued the planning for the operation. At this point Rawlinson had been brought in to command the infantry who would actually perform the landing, and Bacon had evolved the operation to move that landing away from Ostend and instead into three landings around Middelkerke. When meeting with Rawlinson, Haig made it clear that if the landings were successful they would be reinforced, an attack would then also be made from Nieuport, and if all of that went well these coastal attacks would become the primary focus of the BEF. Even with the move away from Ostend, there were some problems that would have to be solved for the landings to be successful. The first was that the monitors, which would be used as sea based artillery platforms, were very slow, which meant that they would be very vulnerable to shore fire. The second was around the weather, the plan involved the use of a smokescreen to conceal the landings, but this required the proper wind, and they also required the proper tide since only a high tide would position the landing properly on the beach, the as a third requirement, it had to be on a night with no moon to reduce German visibility even further. The third major problem, which would still be a concern even if everything else was perfect, was the sea wall which was particularly high on this part of the coast. This sea wall was such an obstacle that the Germans considered it to be impassable, which caused them to reduce their defenses in the area. The plan called for 5 days of preparations between when the order was given to when the landing actually occurred and it would involve 13,750 having to be in position to load, then transport, then unload both the infantry and the 9 tanks that would go along with them. All channel traffic would be halted on the night of the operation, and the monitors and pontoons would both have to be transported to Dunkirk 4 days before the operation started for loading and final preparations. Once this happened it would become far more difficult to keep the operation a secret. Secrecy was believed to be absolutely critical to future success, maybe the most important factor. These landings would be the final form of the plan, and would be what the British infantry and navy trained for in the spring and summer of 1917. This training would be done by the 1st Division. To maintain secrecy the troops were moved to an isolated camp and then essentially quarantined inside of it, with the public being told that there was an epidemic raging within the area. Once the men were in the camp they attempted to prepare as best as they could for the coming operation. Some of this preparation was physical, with a replica of the sea wall built so that they could practice climbing it. This climbing practice was important because the men would not just have to climb the sea wall, but they would have to do so in full battle gear which weighed over 50 pounds. In just a few weeks of practice almost everyong was able to get over the wall, which was a good sign. The second part of the preparations was mental, and in this the men of the 1st Division were greatly assisted by lessons learned from the failed Gallipoli campaign. One of the issues in the Gallipoli landings was the lack of knowledge transfer between officers and men, which meant that when one officer was killed, injured, or simply landed on the wrong part of the beach those that were present did not really know what to do or what they were trying to accomplish. This was an easy problem to solve and time was spent making sure that every part of the plan was known by as many of the participants as possible. There was also a much great emphasis put on making sure that the men on the beach could communicate back to officers stationed on the ships and therefore with Rawlinson and his staff. With all of these concerns addressed as much as possible, it was then critical to find the precise right time for the landings, due to the lengthy set of meteorlogical requirements the times that would work for the landing were somewhat limited, but the date of August 8th was initially targetted. This would then quickly be pushed back to August 24th, the first of what would become a lengthy set of delays. While the men were training for their landings, the British engineers were working on improving the landing vessels that would be used. They would eventually land on a concept of large landing pontoons, which would have landing ramps on the front much like those that would be used in World War 2 which you might be more familiar with. These pontoons were large enough that tanks could be carried and therefore landed with the first waves of infantry, and element that was believed to be critical to the success of the attack. These tanks would carry specially made ramps designed to help them get over the sea wall. All of this construction and engineering work would be done by late May, with plenty of time for training. With both the infantry training and some of the equipment sorted out Rawlinson was pretty optimistic about the chances for the operation, stating that "On the whole I am rather amicably disposed toward the scheme, but much will certainly depend on the degree of surprise that we can obtain and it is by no means easy to maintain surprise at a place like Dunkirk where the Belgians and french talk like May flies." The turn around on the operation had been pretty quick, especially since permission had only been given for final preparations on June 18th, after Haig, Rawlinson, and Bacon were able to talk Jellicoe into supporting it. The final set of plans would give the operation the goals of "designed to cut off the retreat of the enemy's artillery about Westende, to turn his second and third positions, and to penetrate as far inland as possible." Even though everything was in place for the operation there were still many people with concerns about its chances for success. These ranged from concerns about the Germans defenses to possible inclement weather and even the German inundating the area behind the beaches like the Belgian army had done in 1914 to slow the German advance. Then there was also the concern that the landing parties could be stranded, meaning likely destruction at the hands of the Germans. These concerns, and just general conservatism, caused Jellicoe to begin questioning the entire operation in mid-July, he would eventually be talked back into supporting it, but he would never be fully behind the operation. This was a problem since at this point he was First Lord of the Admiralty and had final say on any naval operations. Jellicoe would never stand in the way of proceeding with the operations, but he would always remain a skeptic. While all of this work was being put into making the operation a success there was was one item that none of the men involved with the landing could control, the operation at Ypres. the amphibious operation depended on Third Ypres being a success, and as we will discuss shortly it would be anything but a success. When it was clear on August 1st that July 31st and the first day of attacks had not gone as well as was hoped the question was what to do about the planned landing on August 8th. Rawlinson was still ready to kick it off in the hoipes that it would throw the German defenses into chaos, unlocking both attacks to achieve greater gains. However, Haig never really bought into this idea, and he would always believe that the landings were the ace in the hole that would only be used after the attack at Ypres had been somewhat successful, this would then hopefully amplify the success of the land battle, and make the amphibious landings as risk free as possible. Haig still believed in the landings, but only after a successful attack, and the next attack would always be the successful one, then the next, creating a cycle of endless delays. Bacon and Rawlinson quickly realized the Ypres attack was not going well, and they anticipated, before they were told, that there would be a delay. The first delay pushed the landings into the first week of September. After teh failures of the attacks in mid August they were then pushed back to the first week of October. Then on September 22nd and 23rd, after several more failed efforts, Haig, Rawlinson, and Bacon had a meeting which postponed the operation again, ominously this time it did not receive a new proposed date. The final nail in the coffin for the operation came after the failure of the attacks on October 12th. It was at this point that Rawlinson came to the conclusion that the landings were off the table "Things have not been running at all smoothly-It is now clear that we shall do nothing on the coast here" There was some faint glimmer of hope around the Passchendaele attacks of late October, but these were quickly extinguished. A few days after the First Battle of Passchendaele the landings were officially called off. Evaluations on the possibility of the landings being successful vary, Bacon's successor as commander of the Dover Patrol would say "The attack, if it was ever delivered would be a great disaster, and the unfortunate division which was to carry it out would undoubtedly be annihilated." Haig, Rawlinson, and Bacon always belived in them though, and that is what mattered. This was a lot of information about an operation that never happened, but I think that it is important. In many ways the naval operations were the reason for the attack at Ypres, and part of why they were carried forward after the initial failure. The goal of neutralizing Ostend and Zeebrugge had started the entire conversation about a Flanders offensive, and while they had been surpassed in importance by the Ypres attack in 1917 they were still a critical part of the larger vision for the operation. That they did not happen makes for an interesting what-if scenario. It could have been a great success, with the capture of parts of the Belgian coast, or it could have been a complete disaster, I'm not sure there was a middle option. I have come to believe that the landings would have been costly but successful, but the territory taken would have been far too vulnerable for the British to hold onto long term, and a German counter attack sometime after the initial landings would have pushed them back into the sea. Of course, nobody really knows what would have happened, but if you have opinions I would love to hear them. We will now turn our eyes to the primary focus of this podcast, an operation that did actually end up happening, the land attack in Flanders near the small city of Ypres. Much like the coastal landings, the origins of the attack out of the Ypres salient begin way back in 1915 when Haig took command of the BEF. He had always wanted to attack in Flanders, in 1916 he almost got his wish only to see it pushed to the side in favor of a joint Anglo-French attack on the Somme. 1917 would be different though, and Haig would not be denied his attack, especially after he agreed to support the French offensives in the Spring with his own attack in Arras. While he would agree to assist the French Haig does not seem to have believed in Neville's offensive theories, he would write a letter to General Robertson back in London in April that "Nivelle has attached too much importance to what is called 'breaking the enemy's front'..instead of aiming at breaking through the enemy's front, aim at breaking down the enemy's army, and inflicting heavier losses upon him than one suffers oneself." In this little quote it can be seen that by this point in the war Haig had evolved his viewpoints on what a successful attack should and could be, gone were the heady days of 1915 and 1916 when he believed that a grand war winning breakthrough was possible, now he believed that it was first necessary to wear down the Germans, to basically kill as many of them as possible, before any true progress could be made. In early 1917 he would put out a memo titled "Present Situation and Future Plans" that would be sent to the British War Cabinet, in this memo he would state that "The first step must always be to wear down the enemy's power of resistance and to continue to do so until he is so weakened that he will be unable to withstand a decisive blow." Haig knew that the best way to accomplish this wearing down of the Germans was to get French help, and he would ask for it in a conference in Paris in the first week of May. Petain would originally promise to support the British with 4 French attacks to the south, but these attacks would never happen. At the time Petain was trying to keep the size of the French mutinies under wraps and so he promised something that he knew would never actually happen. by June, when detailed preparations for Flanders were underway the truth of the French situation became known, instead of giving Haig pause, this made him believe that the British attack was even more necessary to make sure that the Germans could not take advantage of the French situation. The original plan for the battle called for two simultaneous attack, sone out of the Ypres salient and then one to the south against the Messines-Wytschaete Ridge. This was quickly changed in the middle of May due to the fact that the British effort in Arras was not winding down as quickly as was originally planned which kept some portion of British resources, especially artillery, occupied. With this issue in mind it was decided that the two attacks would go in two distinct phases. The first of these would be the attack against the Messines ridge, designed to secure the right flank of the attack in the salient. This action would come to be known as the Battle of Messines. The second phase would take place to the north, and it was considered the primary attack with much loftier goals. The hope was that this second attack could be launched soon after the first phase completed, but this "quickly" would turn into a month and a half. One of the key problems when dividing these efforts into two different phases was the positioning of the Gheluvelt Plateau. This plateau was very important due to its positions along the front, the observation points that it gave to the Germans, and the strength of the German positions on it. The British knew that it was important, but when the attacks were divided the objectives of capturing the plateau suddenly got divided between the two attacks. In the first phase, it would be on the far left end of the attack and in the second phase it would be on the far right. This presented the serious danger of neither attack truly neutralizing the defenses on the plateau. Obviously this is me doing some very serious foreshadowing. When Haig was considering this attack he first turned, obviously, to the commander in that area, General Plumer. Plumer was known as a cautious commander, and at this point Haig was uncertain what kind of attack he was hoping for he was trying to decide between a slow and steady approach or one that captured a lot of territory in one effort. Whatever it was that he wanted, and it really feels like Haig himself was not completely sure at this point, he knew that what Plumer provided was not going to fit the bill. 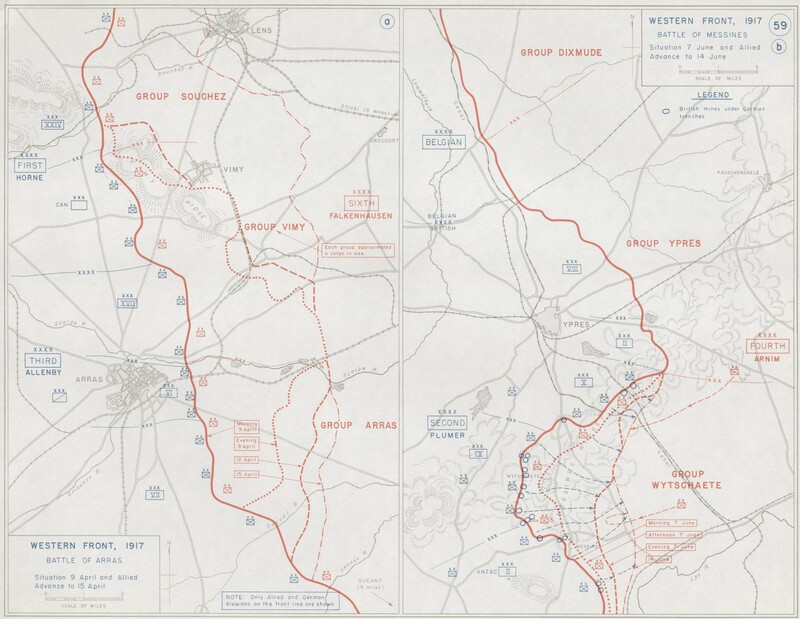 Plumer planned to only take the first set of ridges around Ypres, Messines, and Pilckem. This would require quite a small advance, and even Haig on his most cautious days would be hoping for more. Instead of pushing Plumer to create a larger attack haig began to cast around for another take on the operation. Haig first turned to General Rawlinson, the man who had commanded the 4th Army on the Somme in 1916. Rawlinson and his staff would also produce a plan for the attack and it would not end up being drastically different than what Plumer had created. Rawlinson had fully bought into the bite and hold tactics that were gaining support among many Generals in the war at this time and that was reflected in his plans. He also wanted 42 divisions, out of about 60 total in the BEF at the time, and 5,000 guns which were more than the totan number the British had on the Western Front. Obviously this plan was not the most pratical. While Rawlinson's planning would end up being a dead end, they would still have some influence on the final attack due to how Plumer changed his plans in response. The first change was to move it from one large attack to two different phases, necessitated by the available resources, Plumer's goal was to have just a fwe days between the attacks. Haig believed, and the rest of the leaders hoped, that when the British launched their attacks at Messines the Germans would not see it as a preliminary operation to an attack to the north, they had to hope this or splitting the two attacks apart by several weeks would be considered a huge mistake. It was a huge mistake. While Haig was now somewhat onboard with Plumer's plans, at least for the Messines operation, he still was not quite pleased with the plans for the attack out of Ypres, and so he would bring in another General, and this change would have far reaching effects. Instead of Plumer commanding the entire front of the attack he would now be relegated to just commanding the southern portion, while a new man, General Gough, would be brought in to lead the second phase of the attack. This broke up the attacks into two different armies, making coordination a challenge. Gough was a real hard charger, and he believed that a breakthrough could still be achieved. After he took over his plans would greatly extend the objectives of the attack and bring them more into line with previous British and French efforts. Essentially, eh tripled the planned advances for the first day, what Plumer had as 1,500 yards, Gough now had as 5,000. Plumer planned to eventually advance that far, but only after 4 successive attacks, Gough instead planned to do it all in one day through four efforts in 20 hours. With the first and second being separated only by 30 minutes, then 4 hours, then 0 minutes between the third and fourth. The boldness of this plan brought Gough more in line with Haig's original thinking. There were two big problems that bringing in Gough would cause. The first was simply Gough's inexperience, he had never commanded a campaign even close to the size of what was being planned, there were many other candidates who had far more experience commanding large bodies of British troops. The second problem was the clash of styles between Gough and Plumer, I don't know if you could find two generals in the British army with greater differences between what they thought an attack should look like and what it should be planned to accomplish. Even with these differences they were now being asked to work together, and if they did not do that well the attacks would fail. Spoiler alert, they would not do so well. I think that this point we have talked about the British enough for a little bit, so lets move over to discussing the German situation, and perhaps most importantly when it comes to the results of any Western Front offensive, what specifically they knew about the British plans. To put it simply, the Germans knew that teh British were about to do something, even if they did not exactly know what. They could see from their aerial reconnaissance and from their observation positions on the ridges around Ypres that the British were preparing for an attack. They could see that the British were massing more troops and artillery than they ever had before into one area which was a dead giveaway that something was about to happen. To meet this challenge the Germans were able to move 14 divisions into reserve behind the Ypres front, they even had time for 4 of them to be brought in from the Eastern Front. Ludendorff would also send the man who was considered the defensive expert of the German Army, Fritz von Lossberg, to be the Chief of Staff of the German Fourth Army which occupied the area around Ypres. Before we go too much further, I think it is important to discuss the matter of naming. Wars are always a confusing mess of names, mostly because it is often the case that the two sides in a conflict will call a specific battle something completely different. This would be the case for the attacks in Flanders in 1917. The Germans would call the first phase, which the British call the Battle of Messines, the Kampf um den Wijtschatebogen, or the Battle of the Wijschate Salient. The second phase, called the Third Battle of Ypres by the British, would just be called the Flandernschlact, or the Flanders's Battle by the Germans. I will be using the British names for the rest of this podcast, but I just wanted to throw that bit of trivia out there in case you do any further reading and you see the battles referred to by their German names. Back to the front the Germans had held the positions around Ypres since 1914, and much like other areas of the Western front that they had held for most of the war these were well fortified. By the time that the attack would go forward on July 31 there would be 6 main lines of defenses on the ridges around Ypres. This started with the front line, which by this stage in the war was not strongly held by the Germans. It existed mainly as an observation post, and a lightly held defensive zone that was designed to break up the cohesion of the attacking units. Behind the front line, separated by about 2 miles, was the Albrecht Stellung, or Albrecht Position, then roughly every 2 kilometers behind this position there was another set of positions. First the Wilhelm Stellung, then the Flandern Stellungen One, Two, and Three. These areas were held by trench garrisons who were expected to meet, slow, and then eventually stop the attack. To complete this task they manned defensive dugouts, trenches, and bunkers supported by a large number of machine guns. When trying to mentally picture this it is often easy to fall into a trap where you think about these lines like single trenches packed with lots of defenders and machine guns, while this was true earlier in the war by 1917 they are more correctly thought of as zones. These zones would be up to a kilometer deep and throughout that entire area the machine guns posts, strongpoints, trenches, and wire was spread out. This greatly reduced their vulnerability to artillery fire that was destined to preceed any British effort. All of this was then supported by masses of German artillery positioned behind the various ridges, and more importantly out of sight of any British artillery observers on the ground. This was all just one piece of the German defensive scheme though, and perhaps the more important piece was based around the counter-attacking units. The German defensive doctrine had evolved greatly since the start of the war, and its most important change had occurred between late 1916 and early 1917. This resulted in two key changes the first was the reduced emphasis placed on holding the front line, which meant that it was now lightly held, and the creation and employment of new divisions specifically created for counter attacking against Entente attacks, these divisions would be called the Eingreif divisions. Jack Sheldon, an excellent writer who wrong The German Army at Passchendaele along with books covering the German side of every major battle with the British, felt the need to clarify the meaning of Eingreif, and since I speak only a smattering of German, I think his clarification is important to pass on "Eingreif is generally translated as ‘counter-attack’, but this does not capture the sense of the word fully. To a German it includes a sense of ‘intervening decisively’, or ‘becoming closely involved with'." To control these counter attack divisions was not the job of the commander behind the lines but instead the commander of the troops in the forward defensive zones. This was generally a battalion commander, so not even a very high ranking officer, but from his forward position near the main defensive line he had the authority to issue orders to any of the counter attacking troops behind his front. This included units that were commanded by officers that were senior to him. This setup was critical to making sure that the German units reacted quickly and decisively to any attack. This entire defensive system had been based around countering the British and French ideologies that had evolved during 1915 and 1916. During this time they constantly attacked as far and as deep as they could, stretching their infantry to the breaking point, beyond the defensive cover of their artillery. This would then make them vulnerable to German counterattacks which could then crush the unprepared British positions. The push and pull between the attack and defensive doctrines on the Western Front would be in full display during the 4 months of the Third Battle of Ypres, with both sides being required to quickly adapt. 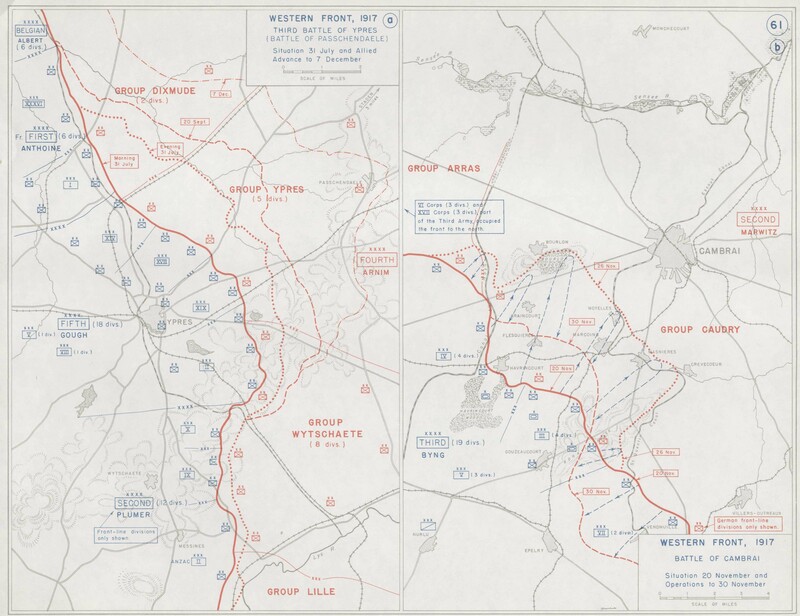 We shift now to one of the most unique battles of the war, the Battle of Messines which would be phase 1 of the British plans. This attack would be led by General Plumer who had the advantage of having been in command of this area of the front for two years. During that time he had obviously given a good deal of thought to the attack that he was about to launch. All the way back in 19115 Plumer had ordered a tunnelling program to be started and in 1916 he expanded that program into the largest mining operation of the war. The British miners would develop 20 shafts reaching out under the German lines, with the longest being half of a mile long. One of the shafts would be discovered by the Germans, but 19 would be completed and ready for the attack. In the lead up to the attack the British would place a million pounds of explosives in the tunnels to be detonated right before the infantry attacked. The British use of mines at Messines was not a completely novel appraoch and the Germans were well aware that the British used mines before attacks. Generally these mining operations were met by counter mining operations, but in this case the Germans had some problems. The German miners had troubles handling the conditions in Flanders as they tried to dig their defensive tunnels. The ground under the lines on Messines was difficult to tunnel through, especially the water bearing layer which had the consistency of quicksand. It would take the Germans all the way until September 1916 to determine a way to get through this underground layer, and the only solution they had was through the creation of concrete shafts, which were both time consuming and labor intensive to create. These difficulties led them to believe that the British would have the same problems, which made them feel more confident that in this area of the fron the British were not going to stage a large mining operation. Unfortunately for the Germans the British had solved this problem much earlier in the war and that allowed them to position their tunnels before the Germans were able to dig deep enough to stop them. While the mines would play the opening role in Plumer's attack, it would then be followed by a 4 phase attack. The first phase was designed to simply occupy the German front lines, which should be almost entirely destroyed by the mines. The second phase was then to capture the crest of the ridge, the third phase would be consolidating the gains that were made, and then finally a possible fourth phase would begin where the British would continue their advance. While Plumer's estimate for this continued advance was relatively small, as usual Haig was hoping for something much more. The British would have triple the number of field guns and double the number of heavy guns when compared with the Germans, and these numbers would give them a gun for roughly every 7 yards of front. They would also be blessed by a lengthy spell of good weather that allowed them to use their aerial observation capabilities to their maximum potential. Both of these advantages would be used for a multi-week bombardment program that consumed several million artillery shells. The attack would begin with the order to explode the mines at 3:10AM on June 7th. When the detonation occurred it would be the largest man made explosion in history and it is said that it could be felt as far away as London. Casualty estimates for just the mine explosion alone vary, but 10,000 German soldiers seems to be a reasonable number. There is some fuzziness in the estimates because it is difficult to known exactly how many Germans were killed specifically by the explosion instead of the artillery fire leading up to it, or the infantry attack that would follow. Regardless of their specific cause the number of German casualties was increased by the fact that when it happened a large relief effort was in place to try and get new units into the front lines, both would be caught in the blast. After the explosions the British infantry would move forward with relative ease. The entire area was destroyed and there was almost nothing left in their path. AFter taking the area that used to be the German fron line positions the British then found the advance to be the typical level of difficulty, with the German rear areas strongly defended and protected by their artillery. In total the furthest British advance was just 2 miles in depth. After the initial attack, adn the increasing German resistance, further attempts were made to push forward for the next five days. However, these were smaller efforts and Haig was already turning his attention to the north, now that the primary objective of the ridge had been taken. There were several discussions about continuing the attack, either to the north toward Gheluvelt or to the south towards Lille. While Plumer would push for one of these exploitation attempts to be pursued, it would have meant the postponement or alteration of the planned attack to the north, which was not permitted. And so the Battle of Messines closed down, with the British being on the better side of the casualty numbers, with the Germans suffering 35,000 to their 25,000. While the German totals were bad, there were also several units that were almost entirely destroyed, with some Regiments with an establishment of nearly 2,000 men suffering almost 1,500 casualties. The positive side of the defense on the German side was how fast they recovered from the initial shock of the mine, it boded well for their reaction to future attacks. On the British side, they gained a considerable amount of confidence from the action on Messines, more than they probably should have. The conditions in place on the Messines ridge, especially the mines, were something that simply could never be replicated, and it was a critical piece of the attack's initial success. In their evaluation the British did not properly account for the role that the mines played in the success, and this would give false expectations for the comming attack at Ypres. The British did not know it at the time, but the attack on Messines would be the high point of their operations during 1917 in Flanders. It was basically all downhill from here. And because of the downward trend for the rest of the operations, after the war there would be a search for scapegoats and for an answer for why nobody stopped the events at Passchendaele in late 1917. To answer that question requires a bit of setup, and it starts with all of the political discussions and maneuverings that led to the attack in the first place. These conversations are important because unlike in some other countries during the war, like Germany, for the British the civilian government was always in control, they had the ability to shape events, or to stop them, if they desired. Here is a quote from Passchendaele: The Untold Story by Robin Prior and Trevor Wilson on this very topic "It is customary to exaggerate the role played by the military arm in shaping the course of British history between 1914 and 1918. Because the nation was at war, the military had an unusually prominent place in British affairs. Further, these years were beset by instances of decision making which seem to epitomize military obtuseness and so are adjudged of military origin." Even though the military takes an oversized role in most stories, including this one, Haig and the British army were not at the top of the pecking order in Britain at this time. The government, led by Lloyd George, had the ability to shape events, but rarely chose to do so. The civilian leadership was well informed of events on the Western Front from both General Roberson, Chief of the Imperial General Staff, and Haig himself and while at times they would be given incorrect information it was almost always information that the British military leaders fully believed to be true. In the lead up to the attack Haig would make several trips to London to discuss his future plans and answer many questions about the situation at the front and how his plans interacted with it. Many of these meetings would be held with the War Policy Committee, which was created in June 1917. This committee was made of several high ranking British politicians, with Lord Milner, Lord Curzon, Jan Christian Smuts, the Chancellor of the Exchequer Andrew Bonar Law, and General Robertson being its permanent members. While the committe would first meet on June 11th it would be its meetings that began on June 19th that would be most important to our story. These meetings, which would last for 3 days, would see Haig appear before the committee to explain his upcoming plans in pretty good detail and then ask for the support fo the Committee. After Haig had outlined his plans Lloyd George launched into a lengthy set of questions. Lloyd George was never a true believer that actions on the Western Front were the best path to victory and the situation in Russia, and growing uncertainty in the French army made him even more concerned about a large offensive effort. His questions which stemmed from these beliefs were by all accounts relentless. Haig was, as always, quite confident in his plans, and he stated that the Russian and French situations just made it more important for the British to launch into action to prevent the Germans from taking advantage of one of their allies. Haig would then use the great excuse, his great out when he was met with criticism for his larger plans, he would say that if it did not start off well in late July it could all be quickly called off. If anybody knows of a single modern military campaign of any size where the commander just decided to call it all off just because it did not instantly succeed, even though he said he would, please hit me up at historyofthegreatwar@outlook.com, because I cannot come up with an example. While Lloyd George would always have his concerns, at the end of the day he and the rest of the committee would not refuse to support Haig's plan. He would later claim that as a civilian he did not think that he should "impose my strategical views on my military advisers." However, at the root of the problem was that Lloyd George knew that if he stood up against Haig and Robertson on this item, without a broad base of support from the rest of the government, he would likely be very vulnerable to replacement. Such vulnerability would probably see him out as Prime Minister and would certainly negatively impact his future. While these discussions resulted in the opening attacks going forward in late July, that is where the real problems would start. Haig's offensive would not start off very successfully, and then Haig did not call it off, because of course he wouldn't. Then that leads to the question of why did the British politicians not intervene after it had started when it was clear that it had not been successful. When considering this question it is interesting to find out that the War Cabinet and the War Policy Committee did not actually discuss the actions in Flanders that much. Over the course of August and September they spent most of their meeting times discussing the situation in Russia and Italy. Most of this revolved around actions that they governments could take to send aid to these two countries. When they did get to Flanders discussions the biggest concerns were around the casualties that the British were suffering. There were three problems with these casualties, the first was that the British and the colonies were coming into a serious manpower crisis. To put it simply at the current rate of attrition the British would have problems filling the ranks of the army in early 1918. The second problem was the large number of casualties being suffered by the Australian, New Zealand, and Canadian units at the front. There was also some concern in London about the support for the war from its former colonies, and as the casualty lists grew this concern would also grow. The final problem was simply the rumors that were swirling around the country. These rumors often greatly exagerrated the number of casualties and were having a devastating effect on morale on the homefront, morale which was already on a downward trend due to war exhaustion and the U-Boat campaign. The Army would waive off concerns about casualties, pointing to the fact that surely the German casualties were much higher, and they did not have nearly the reserves that the British did. This excuse, the constant belief among the generals that they were just one more push away from being done with the attack, and the concern in the government that they would be stopping the best British chance for a victory meant that the attack would continue for many long months. But now we are getting ahead of ourselves, before we talk about how the battle would be drawn out to its bitter end, we must go back to its bitter beginning. Back in Flanders the British were preparing for their attack. To carry out the attack Gough had access to 17 divisions, with just as many ready to move into support the offensive. There would also be two French divisions on his northern flank which would support the British with a flanking attack. Joining the infantry would be 130 Mark IV tanks, which while potentially very useful would have issues on the muddy battlefields. When the tanks would be used they would also not take a leading role, which is a change from past attacks, and from future tank based attacks like at Cambrai in late 1917, isntead the tanks would move forward with the second wave and were tasks with destroying any remaining German strongpoints while the infantry continued forward. The attack would also be well supported by the Royal Flying Corps, who were in a much better place in terms of matching up with the Germans by this point in 1917, a topic that we will cover in more depth in future episodes. In mid July the original date for the attack would be pushed back 3 days to its familiar July 31st start date, this delay was due primarily with concerns voiced by Gough about getting the artillery ready and the current state of the French troops to his north. While the attack would see the infantry go forward, supported by tanks, and with proper air cover, the most important piece of the coming attack was the artillery. To execute his plan Gough would have roughly 750 heavy guns and 1400 field guns. These numbers are a little fuzzy, there seems to be some pretty good variance in the exact numbers of guns present, with anywhere from 1500 to 2300 being given in the sources I have read. My assumption is that these descrepancies are due to some confusion about how many guns were present on these opening days versus batteries that were moved in as the guns progressed, but that is just my assumption. Regardless of the precise numbers, whether it was 1,500 or 2,300, it was a lot. These guns would be arranged on a front of just 7 miles, giving them a density of one gun for every 6 yards of front. It is often said that at these late war battles the artillery was arranged wheel to wheel, but in general they were spread out over a good amount of depth, not just in one long line like you might see on a Napoleonic battlefield, but saying they were wheel to wheel gives a pretty good idea of how many guns were arranged behind the front. The artillery would begin firing 15 days before the attack, on July 16th. The original plan was for only 12 dyas of fire, but when the attack was pushed back to the 31st it was decided that, since the artillery had already started firing, it would just continue. This was a positive development on the whole because some of the heavy guns did not arrive until the artillery preparation had already begun, and the extra days gave them time to participate fully. The big issue for the bombardment was that there was a good bit of fog in the weeks leading up to the attack, this made it difficult for either ground based or aerial bombardment to help direct fire, reducing its effectiveness, especially in the task of the very important counter-battery fire. Even with this issue, it did not prevent the artillery from firing away for six days, until on the 22nd of July it ratcheted up the pace, then on July 28th it upped the intensity even more with particular focus on counter-battery fire, with most focus up to that point having been on known German positions. By the time that the attack went forward the artillery had fired somewhere north of 4 million shells, for reference there were only, and the fact that I am using only here is crazy, but there were only 1 million artillery shells fired on the Somme the year before. On the German side, even before the artillery started, there were definite signs of the approaching attack. Here is General von Kuhl, the Chief of Staff of Army Group Rupprecht who commanded this part of the front, Kuhl would report that “From the beginning of July the signs began to multiply that the offensive was approaching. The enemy preparations were being driven ahead quite openly. Railways were built, the number of battery positions increased and the number of troops along the British front increased. But still there was no attack. The situation of Army Group Crown Prince Rupprecht was difficult and required the Commander in Chief to make serious choices. Concerned, he had to turn his attention to the other fronts; to the Lens area, to Arras and St Quentin where, at any time, there could be an enemy thrust – even if it was designed simply as a diversion or secondary attack." The Germans would have had access to 20 divisions, which they would arrange in 4 clusters. 9 would be manning the various lines of defense on and behind the front, and 6 would be in close reserve behind them. Then there were 2 further back, and 3 more in strategic reserve. The hope was that this arragement would give the Germans the flexibility to rush reserves to any possible area of attack. One interesting administrative change that the Germans had made on the Western Front, that would play a role in the coming conflict, was a move away from Army Corps and instead the formation of Groups. The idea of Groups, was that Groups would have commanders, and they were often named after their commanders, and they would be designated to stay in one area of the front. While the Group and its command structure stayed in one area divisions where moved in and out of the group as necessary, the hope was that this would allow for greater flexibility and stability for divisions as they rotated in and out of the front lines, since they would be coming under the command of a Group that had experience in the area and was fully aware of the situation. This move, and others like it, were important to the Germans as they had to increase their flexibility to make up for their numerical inferiority in the west in 1917. While all of these changes were great on a high level, down in the trenches the biggest concern in late July 1917 was the continuing British bombardment. After having experienced weeks worth of shelling the situation in the front lines was becoming critical. Many positions had either been destroyed or had partially collapsed, it had been very difficult to get rations and water to the forward lines, and at the front sleep had been difficult to come by. The mental strain along was almost too much for many men. Here is Obsertleutenant Freiherr von Forstner who commanded Infantry Regiment 164, "The night [30/31 July] was the worst I ever experienced. The fire increased to an intensity that was simply beyond our power to comprehend. Our blockhouse and a nearby mortar battery received more than 1,000 large calibre shells. The earth trembled, the air shimmered. My pillbox heaved and rocked as though it was going to collapse. Almost by a miracle it received no direct hits. Everyone who dared to go out was wounded. Stabsarzt Katte resorted to issuing opium." General von Kuhl would write from behind the front that ‘In the early hours of 31st July a hurricane of fire, completely beyond anyone’s experience, broke out. The entire earth of Flanders rocked and seemed to be on fire. This was not just drum fire; it was as though Hell itself had slipped its bonds. What were the terrors of Verdun and the Somme compared to this grotesquely huge outpouring of raw power? The violent thunder of battle could be heard in the furthest corner of Belgium. It was as though the enemy was announcing to the world: Here we come and we are going to prevail!" Behind the front the German artillery would also be taking a heavy beating at this point. the British were not able to fully silence or destroy all of the German batteries though, most of those behind Passchendaele Ridge and the Gheluvelt Plateau would remain intact either due to their distance from the British guns or through camoflage from the British aerial observers. The British counterbattery efforts were the least successful in the south, and the German guns in this area would cause serious problems when the attack began. The attack would begin at 3:50AM on July 31st. This time was chosen because it would allow the British to take advantage of the first rays of light over the battlefield, theoretically. There was only one problem on July 31st, there was a thick cover of clouds that meant that in reality the attack went forward in almost completely darkness. In general the attack was more successful in the north and then steadily less successful the further south you go on the battlefield. This meant that in the north the French met their objectives, then to their south the British XIV Corps came within just 1,000 yards of theirs. For the XIV Corps this meant a pretty good advance since their final objectives were 4,000 yards away from their start lines. In the center there was similarly good progress, here the XVIII and XIX Corps made a steady advance, with both achieving their first string of objectives in good time. There were some problems after their first objectives were reached, generally due to increasing disorganization and the slow reduction of support from the British artillery, both of these issues meant that their advance began to slow. When they eventually stopped they would be just 4,000 yards from Passchendaele itself, not as lofty as hoped, but still not horrible for a first effort. So far, the French and 3 Corps of the British attack was going quite well there was just one huge, giant, gaping problem, and that came from the II Corps on the far southern end of the attack. Here the troops had to assault the German positions on the Gheluvelt Plateau, it did not go well. The attack would quickly stall out before getting very far due to a combinatino of the mostly intact German artillery batteries and just the sheer strength of the German defenses on this area of the front. They had particular issues in the areas known as Shrewsbuy Forest and Sanctuary Wood, which by this point could barely be called woods, but what was left of them provided the Germans enough cover to have escaped the worst of the British artillery. German Leutenant Goldner of the Infantry Regiment 240 would have this to say of the German defense on the southern end of the front “[Having beaten off early attacks] the company morale was excellent. Our rifle and machine gun fire was outstandingly effective. Our light machine gun kept jamming, unfortunately, but the heavy machine gun proved its worth constantly. Its crew behaved in an exemplary manner. It directed its fire wherever the British assault troops were mostly densely massed but, because of the fire, it had to change position regularly. The company defended its sector heroically and here the attempt at a breakthrough fell apart. Suddenly, at about 7.30 am, the first British tanks appeared: first four then six. They crept towards us like great monsters, but they could not put the wind up us. We had come across them on the Aisne and had seen them littered about knocked out.16 Let them come!" By late morning the British in the south were basically stopped in their tracks and they were disorganized enough that further efforts on the first day would not prove to be any more effective. With the British attacks now slowing down it was time for the Germans to inact the next part of their plan, the counter attacks. The forward units had fought hard through the morning, and even where they did not stop the British attack they at least slowed it down and more importantly began to sap the British units of their cohesion. With the British having moved themselves away from their protective artillery, and deeper into the German defenses, by early afternoon it was time for the Germans to strike. There would be 6 Eingreif divisions moved up to attack, with the largest of these being targeted towards the center of the British line where they would fall upon 3 of the British divisions, none of which had the time to properly organize and consolidated their positions. While things were going to plan for the Germans, the counter attacks would not be easy. There were two main problems that were difficult to overcome, the first was centered around communication. It was difficult for the German units holding the line to properly stay in touch with those units behind, and to pass information about British movements and locations. The second problem was keeping the Eingreif divisions in touch with each other as they moved forward and into the area hit so heavily by the British artillery before the attack. The second problem was the British artillery. As the counter attack began they were outside the range of at least some of the British guns, but in the areas where they had success they soon found themselves moving right back into the teeth of British and French artillery strength. These were the same masses of artillery support that had made the opening attack successful, and now the Germans were trying to attack into it. The British had also learned from previous attack and they did all that they could to fire as intense of a barrage as possible in front of whatever positions the British infantry were occupying. Even in the instances where the British infantry had to fall back, the infantry kept firing, so it became more and more difficult to keep German units moving through the curtain of fire that seemed to never end. In several areas the British troops were forced to retreat, but not without a great cost being paid by the counter attacking forces. The British had not been properly prepared for the German attacks, and it would cost them some of their gains from the morning. Even with these setbacks the British had captured roughly 18 square miles of German held territory, with the largest advance being a bit over 3,000 yards, or about 3 kilometers. For these gains the British had sacrificed 23,000 men as casualties. Losses were also heavy on the German side, but definitely less than 23,000. What was important on August 1st was not just the top line number though, but instead how it had affected the fighting strength of the divsiions that were on both sides of the line. British British and German divisions that had suffered heavily on July 31 would continue their fighting, and while reinforcements were on their way for both sides, they would not appear instantly. This would begin the slow and steady grinding through of divisions as they came into Ypres, were destroyed, and moved out, much like what had happened with the French at Verdun. Here is a good report from the German side detailing the number of casualties in the first two days of fighting for some of the divisions, and the recommendation on how long they would need to recover. "Fighting Strengths: 3rd Guards Division. Casualties, approximately 3,000. The division needs to be relieved and given two to three weeks rest. 50th Reserve Division. Casualties, approximately 1,500. The division needs to be relieved in a few days time and then requires two to three weeks rest. 221st Infantry Division. Casualties, approximately 2,150. The division needs to be relieved in a few days time and then requires two to three weeks rest. 38th Infantry Division. Casualties, approximately 4,000. The division needs to be relieved and given two to three weeks rest". For the British, while the gains had been costly, any gains were good, the problem for the British was that most of these gains were focused in the north, and they were partially sabotaged by the lack of progress in the south. There, against the Gheluvelt, the British had advanced just over 1,000 yards, but most importantly they had not succeeded in removing the Germans from their important defenses on the high ground. Because of this failure it would be difficult to continue the advance in the north since they would be under fire from Gheluvelt the entire time. Gheluvelt would simply have to be dealth with, and it would be, but that would mean further preparations, further artillery expeinditures, and more time. August 1st would end up being relatively quiet as both sides took a bit of a breather before the next big effort on August 2nd, there were still small bits of fighting along the front, and plenty of artillery. When the attack would restart on the second, it would be joined by the most infamous participant of the battle, the rain. In total the month of August would have just 3 days in which no rain was recorded on the battlefield, and even on the days when it did not rain very much, it still dropped enough moisture to prevent the ground from drying out at all. For the month the amount of rainfall would be double the average, and while this was bad for any British attack, the state of the ground around the battlefield made it infinitely worse. The area around Ypres had seen 3 years of fighting, and then millions of artillery shells had been dropped around during July. All of this meant that the natural and manmade drainage systems had been catastrophically damaged. When this was combined with all the nice little pools that were created from shell holes meant that there was soon standing water everywhere, and under it a soupy, sucking, mud. For three days, from August 2nd to 5th the French and British forces would try to continue their attack, and the result would be total casualties several times greater than on the first day. Eventually the British were forced to call a halt to the attack until the rain stopped, and hopefully at that point the ground would dry out and then maybe things could continue. Even if the British and French were not attacking it was not like everybody could just go home, men had to continue maining the front in the muddy hell that it had become. There was also the constant need to move things around behind the lines. Whether it was men and supplies moving up to the front, or exhausted men moving back, or repositioning artillery, there was no shortage of things to move in the mud. Nowhere was safe from the mud that could swallow men like quicksand or the shell holes in which men could easily drown. The only way to do these type of conditions justice is through first hand accounts, so first here is a British officer who was stationed in a captured German bunker "Inside it was only about five foot high and at the bottom there was about two foot of water. This water was simply horrid, full of refuse, old tins, and even excreta. Whenever shells burst near it the smell was perfectly overpowering. Luckily, there was a sort of concrete shelf the Boche had made about two foot above ground level. It was on this shelf that four officers and six other ranks spent the night. There wasn’t room to lie down, there was hardly room to sit upright, and we more or less crouched there. Outside the pillbox was an enormous shell-hole full of water, and the only way out was over a ten-inch plank. Inside the shell-hole was the dead body of a Boche who had been there a very long time and who floated or sank on alternate days according to the atmosphere. The shellholes were crowded with dead and dying men, the latter crying out for help as they slowly expired." Here is British Sergeant Major J.S. Handley "In my searching I had come across a pack-mule sinking int he mud. His load had been removed and he had been left so far submerged when I saw him that only the top of his back, neck, and head were above the mud. I'll never forget the terror on his face with his eyes bulging out of their sockets. I just could not leave him in his agony, so, putting to his head a Smith and Wesson pistol I had found, I shot him." While it was difficult to live at the front, it was also a real challenge for the artillery to move around, especially on the British side where they were being pushed forward to prepare for the next attack. It was not atypical that a battery could spend over 6 hours and only get their guns a few hundred yards, and these would be the lighest of the guns, the 18 pounders, the heavy guns would take even longer. While the attacks of the first few days of August were moving forward, Gough was also planning his next major effort. There would be two objectives of the next attack, the first was just to capture the Gheluvelt positions which had not been captured on the first day and the second objective was to retake the positions that had been lost to the German counter attacks on the first day. This was very much a serious step back, sort of hunting for a do-over. The constnat rain would delay these efforts until August 10th, at which point the Gheluvelt attack would be launched, and it would result in over 2,000 casualties for basically no gain. The attack across the entire front was then launched on the 16th, and once again little was gained on the British right or center. It was only on the left where anything was really gained, and there the advance would be just over a 1,000 yards, which did allow the British to capture the village of Langemarck. In total, these two attacks would cost the British 15,000 more casualties. The real problem, in all of these efforts, was the complete superiority of the German positions on Gheluvelt, they were just suffocating any attacks in the center or on the right due to their complete vision of what the British were doing. After these attacks it was clear to most of the British leaders that something had to change. Gough would place the blame on his commanders and men, at a conference with his Corps commanders on August 17th he would just straight up blame the men and their inability to hold their ground. He then said that he thought it might be necessary to court-martial some officers and NCOs to set an example for the rest. This idea would thankfully never be implemented, but around this time gough also put in place plans for 3 more attacks on the 19th, 21st, and 22nd. Their goal was to get all the objectives that were missed on the 16th, still. Then once that was complete another general attack would commence on August 25th, all of these plans would end up being scrapped. Instead, on the 24th Haig, Plumer, and Gough would meet and Plumer would be told that his front was being extended to the north which would allow it to incorporate all of the operations the Gheluvelt Plateau. This was a clear vote of non-confidence in Gough's ability to carry it forward, and it would end up being a good move for Haig to make. Even with the change in command there would be one final attack in August with a small attack launched on the 27th to capture Glencourse Wood and Inverness Copse. Once these attacks were completed it would mark the end of the first phase of the battle, with the next British attack not occuring until late in September. At the end of the first phase the British had suffered 70,000 casualties, with 18,000 of those being killed. This in a month where some ground was taken, but none of the final objectives for the initial day of attacks were in British hands. Here is John Keegan discussing the situation in his book The First World War "Despite losses lighter than those suffered on the Somme in a comparable period, the fighting was assuming for those caught up in it a relentlessly baleful character: constant exposure to enemy view in a landscape swept bare of buildings and vegetation, sodden with rain and in wide areas actually under water, on to which well-aimed shellfire fell almost without pause and was concentrated in lethal torrents whenever an assault was attempted against objectives which, nearby in distance, came to seem unattainably remote as failure succeeded failure." While the Britsh would soon be re-evaluating their offensive, the Germans were also doing the some introspection of their side of the lines. Overall, the defense had done well so far and after the first day it had a pretty good track record of holding the British attacks to very few gains. This did little to asuage the greatest concern for the Germans, the casualties that they were suffering while trying to hold the line. The manpower situation had been a German problem for all of 1917 as they shuttled troops all over Europe, many of these would actually be temporarily alleviated in just a few months with the exit of Russia from the war, but in September 1917 all the Germans could do was do their best to keep the men in fighting shape. To do this the Germans put in place processes that they had learned over the years of defending on the Western Front. Some of these processes were common sense, like rotating men out of the front line so that they could get rested. These rest periods were just as much for mental recuperation as they were for physical rest. These periods out of the line often greatly raised morale in the units after their period of the hell of the front lines. Here is a German infantry officer discussing what it was like to be behind the front “The performance of the artillery on both sides during this battle was just extraordinary. At night we often stood outside our billets and marvelled at the coloured light show that was being played out forward at the front. At all times we were ready to be called forward to take our place in the hell of the front …" While moving the infantry out of the line was common practice at this point in the war the Germans were also making it a point to pull the artillery out of the danger zone as well. With the emphasis being placed on counter-battery fire the artillery was just as much in danger as the infantry and it was important to give the men who manned the guns time away from the front as well. This also allowed the guns to be serviced or replaced, a critical component of maximizing firing potential, and maintaining high accuracy numbers. These processes would help the German defenders recover over the course of the break in British attacks. It might have also helped that they knew that the British were suffering as well. The Germans noted a serious dip in British morale by the end of August, with Crown Prince Rupprecht recording on August 16th that ‘British prisoners are saying – and this has never been heard before – that they wished that they had shot their own officers who were leading them into the slaughterhouse. They have had enough of this butchery!' On August 22nd he would address the topic again "Of the British prisoners who have been brought in during the past few days, the NCOs and men are complaining about the defective leadership of their officers; the officers about the failings of the staff officers. Nobody believes that there is any chance of defeating Germany without American assistance." While this gave the impression that British morale was on a downward trend, it would never hit the levels that the Germans hoped that it would, and so the attacks would continue. With the change in command on August 24th the focus of the British attacks would shift to the south. After surveying the situation Plumer asked Haig for a pause to allwo for proper preparations to take place before the next attacks were launched. This pause would continue for almost a month. During this time Haig would be called to London, and on September 4th he would be asked to justify the continuing attacks. At this point in 1917, with the Bolsheviks only weeks away from toppling the Provisional Government, there were already serious concerns in the British Government about its ally in the east. With this being the case, and the continued uncertainty on the French side of the line, Haig believed that it was more important than ever that the British continue to put pressure on the Germans. In this viewpoint Haig was supported by Robertson, and the result would be the continuation of the attacks. The next set of attacks would be different than the previous efforts. Plumer had a different mindset when compared to Gough and he also believed that he had found the key to defeating the German defenses. The Germans had created an entire defensive doctrine based around stopping the British attemps to deep penetrating offensives. This was done by placing multiple lines of defenses that could slow and then stop any attack and then positioning power counter-attack forces that could hit the British troops when they were at their weakest. Plumer believed that this not only made a breakthrough impossible, but also advances of more than a few miles or outside the range of British artillery. He believed taht the weakness of the Germand defense lay in attacks that did not try to go too far. Plumer planned to launch an attack that involved multiple small jumps over the course of several efforts, with each jump being just 1,500 yards. This would get the British through the thinly held part of the German lines, but would not push the British attackers outside the range of their artillery. This would then let the artillery protect the infantry from the inevitable counterattacks while they organized and prepared to defend the new gains. This preparation would be done over a period of 9 hours, during which the artillery would lay a constant curtain of fire. If all went according to plan the Germans would not have a chance to launch their counter-attacks at all, and if they did they would just be chewed up by the artillery. To amplify the changes of these little jumps being successful Plumer also planned to do it on a very small front, with each division occupying just 1,000 yards of the front. Plumer would also be putting in a new plan for the artillery. The first difference in the artillery was one of concentration. Plumer would have an artillery piece for every 5 yards of front. This concentration would hit the Germans with 5 waves of artillery fire. The first wave would be shrapnel, the second high explosives, then the third was indirect machine gun fire, then two more waves of high explosives. This new, highly concentrated, and well organized artillery fire would beginning falling on the Germans early in the morning of September 20th. Reserve Leutenant Hess of Infantry Regiment 77 would be in the front lines when it did "All hell broke loose. Only by bawling at the tops of our voices at one another could we make ourselves understood. The enemy also fired gas and incendiary mortar bombs of the largest calibre. My batman had prepared a sandwich for me, despite the overwhelming bombardment and, in order to keep it as clean as possible from the constantly falling showers of filth, I had to keep it covered with my other hand. Punctually at 6.00 am the artillery fire began to fall once more. It was an absolute torrent of fire, which was completely outside my accustomed experience." Gefreiter Johann Muller of Infantry Regiment 60 would also be caught in the cauldron of fire "When you see the position, you would think it almost impossible to be able to get through such a desolate crater field. The shelling never ceases. Yesterday an enemy aircraft circled over us, directing fire on our blockhouse. The British fired over 300 shells at us and we thought the whole thing would collapse on us at any moment. The companies, including the officers, spend the whole time in the open, in shell holes. Normal command is impossible. Everyone has to huddle down in a crater, stay hidden and do what his neighbour does. The word ‘Position’ exists only on paper. Throughout the night the shells continue to rain down. But the ground is boggy, so the risk from splinters is not very great." With this kind of artillery fire it was almost impossible for forward positions to communicate with the units behind and this made it hard for the German officers to determine what was happening, which would greatly slow their response to the attack. This sluggish response would play right into Plumer's hands. The attack would sometimes be called the Battle of Menin Road, and its sole purpose was to cpature many of the German stronpoints that had been holding up the British since the early attacks in August. There would be 65,000 troops going forward on a small area of the front. When the British attacked they did so behind an almost impenetrable creeping barrage. The Germans, those that were left in the front lines, had no chance of stopping the attack. When the British and Australian attackers reached their objectives, just a bit over 1,000 yards from where they started, they just stopped. The artillery fire continued in front of them while they began to frantically repair and construct defenses. The Germans, barely realizing what was happening, and only after waiting for the British to continue forward, would launch their counter-attacks too late. There would be several such attacks, but only one of them would have any kind of success, the rest would be repulsed with heavy losses. Reserve Leutenant Zimmer of Infantry Regiment 459 would give his view on the end of the fighting like this "The day drew to a close. As the sun sank as a blood-red fireball in the west, it created a scene of weird beauty and the entire horizon appeared to glow. To our front a wrecked concrete bunker blazed as the flares which had been stored inside shot into the air in a series of red and green streaks. This was punctuated by the sound of the boxes of hand grenades exploding. Muzzle flashes which lit up the horizon betrayed the location of the British heavy batteries which were bringing down interdicting fire on the rear areas in order to interrupt the forward movement of supplies and rations. The twilight faded rapidly and soon it was difficult to make out the faint outlines of the shot-up tree stumps against the evening sky." With the night closing in the attack was over, the British had captured a line of German defenses that had hampered their previous attacks. For these gains they suffered 21,000 casualties in total, mostly from German artillery fire after the advance was complete. Even though they had advanced to a maximum of 1,250 yards they had at least accomplished something, and they had now completely changed the course of the offensive. The British had finally done something unexpected, and they were just getting started. The next attack in Plumer's step-by-step approach would come on September 26th, and it is known to history as the Battle of Polygon Wood. The goal of this attack was to capture the wood and the village of Zonnebeke. This meant that the attack would be similar to the previous effort, still focused on continuing the advance on either side of the Menin Road, with the front even narrower this time, the objectives were also even closer. Haig and Plumer wanted the attack to go forward as soon as possible, but there were limits to how fast preparations could be made. Much of this was driven by the same limitations that had been experienced since the start of the war, the time it took to move the artillery forward. This issue was even more problematic at this moment due to the state of the ground, which was still incredibly wet and muddy which slowed everything down. After the battle of Menin Road and efore Polygon Wood the Germans were beginning to question their new defensive tactics, some commanders were concerned that the British would try to replicate their previous success, and so they began to chance their tactics. This change involved moving more troops into the front lines to try and hold on against the attack, instead of letting the British take their little piece of ground. When the battle began these changes would do nothing to reduce the effectiveness of the British strategy. Polygon Wood would be captured by the Australians, and while it was a bit more difficult than the previous attack this objective was still accomplished in good time. Then the infantry began digging in while the artillery protected them, and the Germans then launched some counter attacks that were not very successful. At the end of the day the British had sacrificed 15,000 casualties to gain about 3.5 square miles of territory and once again the effort was considered a success, a costly success, but a success. The next attack would begin on October 4th and it would be a disaster for the Germans. After the auccess at Polygon Wood the attack was brought forward two days from its originally scheduled October 6th date to the 4th, a welcome change from the previous trend of delays. Haig was begining to sense that the Germans were having problems, which they were, and possibily even collapsing, whcih they were not, but it was obvious to everyone that the British were onto soemthing. At 6AM the Australians once again attacked after a massive artillery barrage. Unteroffizier Paul Stolz of Infantry Regiment 92 would be in the front line on the morning of October 4th "The 4th October dawned. It was a day which for me and many others will remain unforgettable. Already by 5.30 am the British brought down drumfire of an intensity you would hardly believe possible.19 320 mm howitzer rounds were sent crashing down on our positions in an uninterrupted series. The aim was to snuff out all life. Only a few unteroffiziers and their men were still holding out. On the left [south] of the Beselare-Ypres road many had pulled back to where, as I later discovered, the artillery fire was less intense. But we were bound to stay where we were in order to protect the battalion staff. Shell after shell smashed into our ranks. Several of our mates were buried by a direct hit. Others followed. Many were buried alive." In their attacks the Australians would capture almost all of the Gheluvelt Plateau, the thorn in the side of the British attacks from the start. On October 4th the German Fourth Army would report that "Once again the British attacked along the line from Langemark to south of the Ypres-Menin Road. The main foci of this major day of battle were Poelkapelle, the Passchendaele area, Zonnebeke, Beselare and the village of Geluveld. The British only gained a narrow strip of territory from Poelkapelle to Zonnebeke and Beselare. This was totally disproportionate to the very heavy casualties." The British suffered another 20,000 casualties for these gains, but this time the attack was very costly for the Germans, more than the previous attacks. This was due to a critical change that had been made in the German defenses before the attack. After seeing two British attacks follow the same template the German commanders were now convinced that the British would continue the trend, and they were not quite sure how to respond. Ludendorff would write that "Our defensive tactics had to be modified in some way. We all felt the same, but it was incredibly difficult to find the correct solution. We could only feel our way forward carefully towards one. The proposals which were made to me by the men on the spot inclined me towards a return to our earlier tactics. This meant an, admittedly only very slight, strengthening of our forward positions and dispensing with counter-attacks by our Eingreif divisions." These counter-attacks would eventually be launched, but not as soon as they had been before, instead they would be held until the line had settled and the Germans could properly prepare. This move basically meant throwing away all of the new defensive plans and going back to much older methods. This quick reversion to previous tactics betrays a bit of a panic from the German side and the inability to quickly adapt. They had based their entire planning around the Entente troops over extending, if they did not do that, then everything had to change. What this meant was that when the heavy artillery fire began before October 4th, the German defenses, instead of being lightly held were a target rich environment, and they paid dearly for it. Ludendorff would comment after the battle, and in what I think is a typical Ludendorff fashion when things did not go according to play he would try to shift blame away from the defensive changes "An infantry battle began on 4 October. We survived it, but only at enormous cost. It showed that the strengthening of the front line which had been introduced after my last visit in September was not a cure-all. I then followed my own judgement, without asking any further questions and recommended to Fourth Army that it introduced the use of a narrow strip of territory between the enemy front line and the line where our own troops were to conduct a mobile defence. If the enemy wished to launch an attack, they would have to cross it. This would gain our artillery time to engage them, before they closed with our main defensive line. The great difficulty lay in withdrawing the forward garrison in the event of an attack … The principle was simple and clear. Fourth Army was reluctant to follow my proposals about the use of an area of advanced posts; only gradually were they convinced about it." It had been raining since the beginning of October, but Haig wanted another attack to go forward soon and so he pushed up the planned October 19th attack to October 9th. Plumer was was becoming concerned about the weather, and he even suggested closing down the attacks instead of continuing this forward, but when Haig wanted more attacks Plumer did not refuse. Even though Haig wanted further attacks he did allow changes to be made based on Plumer's concerns, these changes mostly just pulled back on the objectives of the attack to make them more easily attainable. One new item that the British were having problems with was the positioning of their attacks as they advanced. With the British now making consistent progress they found themselves advancing deeper into the Ypres alient, making it more and more difficult to get their artillery into positions due to the simple lack of area. This was just exacerbated by the state of the ground, with all the mud it was difficult just to find a spot to put a gun that woul dkeep it steady and on target. The continued push forward into the salient also made them more vulnerable to German counter-battery fire, which could be delivered from more and more angles. The reduction in effectiveness of the British artillery was met with an increase in artillery strength on the German side. All of these problems, coupled with the fact that the weather continued to be very poor meant that some units earmarked for the coming action, called the Battle of Poelcappelle, did not even get to the front in time to participate in the attack, and it would result in disappointing results. What little ground was initially gained was wiped away by the German counter-attacks that were once again successful due to the difficulties experienced by the British artillery. By the end of this last action, both sides were exhausted, and the second phase of the Third Battle of Ypres was over. The British units had spent the last month slowly bleeding to death in small bit and hold attacks that were gaining some ground, but not enough. new units had to be brought in, and the artillery needed time to reorganize, regroup, and reassert their place on the battlefield. On the German side the situation was just as bad, the losses were unsustainable. Crown Prince Rupprecht would write on October 10th that “There was very high wastage within the divisions of Fourth Army yesterday and we fired off the equivalent of twenty seven trainloads of ammunition. This time it is still possible to bring forward sufficient troops to conduct the necessary reliefs in the line, but if, as is to be expected, the French attack the Seventh and Third Armies simultaneously with the British continuation of attacks against the Fourth Army, the Army High Command will not be in a position to despatch sufficient fresh troops forward to help us. If this happens we shall have to get by with what we have and that would mean giving up our less important positions to the enemy and pulling back slowly and gradually from one position to another." With no other choice, Ludendorff ordered the German commanders to switch back to the elastic defense they were using at the beginning of the battle, a move almost strictly done to reduce casualties. This meant that the front lines would be thinned out once again. While both sides were already thinking about what would come next, one constant remained. The rain that had begun at the beginning of October continued to fall, the mud deepend, the water rose. Life was miserable for everyone involved in the fighting, but the fighting and dying were not yet over. There was still one more objective, the most infamous of them all. It was a pile of rubble that used to be a village, and they called it Passchendaele. Early October was the point at which the actions in Flanders were once again the topic of conversation in London. There were concerns that the gains simply did not justify the cost. Haig and the army would always fall back on the defense that no matter how many men the British were losing, the Germans were losing more, so if you looked at the big picture the British were actually winning. The problem with this line of reasoning was that it was based on numbers that were incorrect, the German casualties were slightly lower than the British casualties. While several British politicians would voice concerns, nothing would be done to stop the attacks, partially out of fear that they might just be one more attack away from getting through the German lines. This was actually a concern that had been in the back of Haig's mind sicne 1914 when he had commanded the troops in the First Battle of Ypres. Haig knew that back in 1914 the BEF had been one stiff breeze away from having to retreat from Ypres, if the Germans would have attacked one more time they would have been able to push the Britsh aside, he was determined to not be in a similar position with his attacks. And so, the attack would continue. Haig, while able to side step too much pressure from London also had to deal with Plumer and Gough, who were becoming less and less convinced that continuing the attack was the right move. This shift if belief was due mainly to the continued deterioration of the weather. Haig was totally against the idea of ending the attack, he was fixated on taking one more objective, Passchendaele Ridge. The problem was that this ridge, and the village that it was named after, was around 2,000 yards from the British front. This meant that it was further than any of Plumer's attacks had gained, and more than had been captured since July 31st. With Haig convinced that this was the right move, Plumer and Gough began to prepare for the effort. The only divisions that were left with enough strength to launch another large attack were the Commonwealth divisions. This would be the two ANZAC Corps made up of Australian and New Zealander troops who would be used to execute the first phase of the attack and the Canadian Corps which would be brough in to relieve them. The artillery fire would begin on October 9th, and it was in conditions that were simply impossible, the rain never seemed to stop, water covered everything, and under water was the seemingly bottomless morass of mud, clay, and death. One German soldier, Vizefeldwebel Zascke of Grenadier Regiment 9 would be unable to describe how bad the situation was. "If you wished to find one single sentence to encapsulate what it meant to endure the worst drumfire imaginable, to hang on in ploughed-up terrain which made a mockery of every attempt at orientation, where there was a lack of food, where life was lived out in shell holes and mine craters, where it was impossible to distinguish the clay from the water, where all appeared to have been reduced once more to the primeval swamp from which our planet developed millions of years ago, this was the best attempt that could be made: Yes, we were in the Carpathians and took part in the breakthrough in Galicia; we were there on the Somme, we have got to know the worst of the Eastern and Western Fronts, but here … and words failed everyone." The first attack against the ridge is sometimes called delineated from the others as the First Battle of Passchendaele, and in this attack the Australians took a crack and moving forward. This would take place in the early morning of October 12th. While in most of his previous attacks Plumer had been able to guarantee at least some amount of forward progress there was one big difference between this attack and most of those previous efforts, and that was the amount of available artillery. In previous attacks the amount of artillery had been able to suffocate the German defenses, however during this attack it was barely enough to do anything. This all went back to the same problems the British had for months, it was hard to move artillery around, it was hard to find stable ground to anchor down to, it was all just hard. This lack of artillery support meant that that even though the ANZACs were able to fight their way forward and make some progress, they were soon overwhelmed by the response from the German artillery and machine guns, which were perfectly positioned to hit the attackers in the flanks as they tried to consolidate their positions. By the end of the day most of the gains had to be given up due to German fire and counter attacks, and so basically nothing was gained at a cost of over 12,000 casualties. With the ANZAC Corps due to be taken out of the line, they had been there far before the October 12th, it was decided that it was time to bring in the Canadians. General Currie, the commander the Canadians, was not exactly thrilled with what he was being asked to do. When he evaluated the situation he believed that trying to take Passchendaele would cost him at least 16,000 casualties. While he was concerned that the gains would not be worth the casualties, he would not refuse to give it a go, but he did plan on doing some things differently. First, he wanted a lengthy break to allow for the artillery and his soldiers to get properly setup. Then he scrapped the idea of trying to take the ridge in one large attack and instead he planned on multiple small attacks that were only set to gain 500 yards each. This would allow his troops to slowly inch their way to the ridge and the village. There were not going so well on the German side, one continual problem was trying to get supplies to the front line. With the British artillery advantage the first that fell on the German lines almost constantly caused problems when trying to get supplies and men forward. Here is Feldwebel Kubeile of Grenadier Regiment 9 discussing some of the lengths that the Germans soldiers went through to try and get supplies to the front "For days no rations had been got forward to the company, so it was essential that somehow food was got to them, if the grenadiers were to be able to hold their positions. Men were assembled from the transport lines and quartermaster’s department, but there were very few of them; most were only ‘fit for garrison duty’. Grenadier Kelm volunteered for this duty even though he fell into this category. He had been severely wounded in the foot and had to wear an orthopaedic boot. Despite our reservations, because he could barely walk, he insisted on being allowed to proceed; he was determined to take food forward to our comrades. However, on his way back, he met a hero’s death." The conditions on the grouns also began to serious hinder efforts to evacuate the wounded. Jack Sheldon from The German Army at Passchendaele would say "enormous numbers of casualties accumulated in holding locations all over the battlefield. They lay packed into concrete pill boxes where they could be squeezed in, in folds in the ground and shell holes and, in some cases where the stretcherbearers had been hard at work moving them to the rear, they were assembled at collecting points waiting for transport to the rear. Inevitably, such were the delays, that many who might have been saved succumbed to their wounds and in any case, all the time that they remained in the forward battle area, they were still vulnerable to being wounded or killed by random shell fire." While the Germans were having to difficulties, if you think about it the British attacks, which had begun back in July with the aim of capturing miles and miles of territory, of maybe occupying enough German troops to allow for seaborn landing that would hopefully take over a decent amount of occupy Belgium, that would reduce the effectiveness of German U-Boats, that might even turn the entire right flank of the German front, was now reduced to trying to, hopefully, maybe, advance 500 yards just a few miles from where they started back in July. 500 yards. The Canadians would make their first attempt during the Second Battle of Passchendaele. This attack would be launched on October 26th by the 3rd and 4th Canadian divisions. On that day they would gain just 500 yards, all according to plan, at the cost of 3,400 casualties. Another problem that the British and Canadians had by this point was that due to shell holes and other obstacles the available attacking lanes were quite narrow, and this meant that just a few German machine guns could have a crippling effect on an attack, especially if the infantry fell behind the artillery barrage even just a little. If this happened the infantry would be low on options due to the restricted mobility that they were experiencing, which limited the amount of flanking maneuvers that could be done. After four days of preparing the next attack was launched on October 30th, where once again they would gain another 500 yards. These efforts were costing thousands of casualties, but they were at least meeting their objectives. After this second attack the 3rd and 4th Canadian divisions were rotated out of the line and the 1st and 2nd Divisions put in their place. This would take 5 days, so the next attack would be launched on November 4th. When this attack went forward it would have the advantage of decent weather and it allowed the Canadians to gain a foothold in the village of Passchendaele itself. During this attack the Canadians had been able to get enough artillery, and then to stay close enough behind it, that the defenders in the pile of rubble formerly known as Passchendaele were simply overwhelmed. On November 6th Crown Prince Rupprecht would write that "This morning the enemy launched an attack with strong forces against Passchendaele. [...] in Passchendaele, the enemy succeeded in breaking in. Whether it will still be possible to win back Passchendaele and to hold it, along with the ten kilometre ridge which runs behind it, without too high an expenditure of troops remains questionable." On November 10th the Canadians would attack again, and they would finally be able to capture the rest of the ridge. After almost 3 weeks of trying and more than 15,000 casualties the Canadians had managed to advance a few thousand yards, and make it to their final objective. And this this success, after 3 and a half months, the Third Battle of Ypres was over. When all was said and done the total casualties for the British for all of their long efforts was right around 250,000 casualties, 275,000 if you include Messines as well. Even on the scale of the First World War, this was an astronomical figure. It reduced the British army by the equivalent of over 10 divisions, and they only had 60 total. It was impossible to quickly recover from this kind of blood letting and the British would still be feeling the effects of the attacks well into 1918. On the German side the top line number was not quite as bad, somewhere around 200,000. Even this lesser number was a serious problem for the Germans though, who were already having trouble making up losses. While these manpower issues would be somewhat aleiviated by the Russian surrender in early 1918, allowing troops to be moved from the East, it still left the Germans on the road to the manpower desert of late 1918. For the rest of 1917 the Germans would be very short of men in the West, with the typical German battalion, with an establishment strength of 2,000, down to just 640 men. With almost 500,000 men now either killed, wounded, or missing, the question became, was it worth it? The British had advanced a maximum of four and a half miles. This was a pretty reasonable distance, by Western Front standards, but the problem was that the ground that they had captured was, to put it very bluntly, completely worthless. Haig would take it up like it was a great stepping stone to further attacks in 1918 but the generals closer to the front had very different thoughts. Plumer and Gough considered the areas to be worthless and Rawlinson, who was brought in to replace Plumer when he went to help the Italians would almost instantly begin drawing up plans for a retreat from all of the territory gained in the attack, plans to be enacted if the Germans attacked in any strength. When it came to it, when the Germans did attack in Flanders in Spring 1918 the British would quickly evacuate all of their gains from the Third Battle of Ypres in a grand total of 3 days, territory it had taken them almost 4 months of fighting to wrestle from the hands of the Germans, territory that it had cost 250,000 casualties to take, given up in 3 days. The Third Battle of Ypres was over, but before we end our discussion of the British and German actions of late 1917 we have to talk about Cambrai. The Battle of Cambrai would occur quite late in the year, on November 20th. The roots of the attack were actually at Passchendaele, where Haig, without much to show for the efforts in Flanders was hoping that the attack at Cambrai would let the British end the year on the high note. In his search for a plan to execute with a good chance of success he was given one developed by Brigadier General H. Elles and General Byng of the Third Army. Elles plan involved using tanks in a surprise attack across ground specifically selected for the effort, ground that would allow the tanks the best possible chance of success. This attack would not be prefaced by a lengthy artillery program, instead there would just be a surprise bombardment designed to leave the ground as intact as possible, again to facilitate the use of tanks. The goal was to hopefully break into the German defensive lines to a depth of 4 miles in a single day, more than the British had gained at Ypres. All of this was built around the tanks, and the tanks are what makes the battle of Cambrai special. It is sort of the first time that it really feels like the British understand tanks, how to use them, and how they can make them successful. There were initially 300 tanks provided for the attack, but only 215 would be ready for the assault, and then 71 of them would break down during the attack. While the British were figuring out how to use the tanks, they were still working on how to keep them running. These tanks would be used to lead the opening waves of infantry across no man's land. When the attack began it had the advantage of catching the Germans almost completely by surprise. This surprise, coupled with the masses of tanks, caused many German units to retreat quite quickly. Within 4 hours the British had advanced to their objectives, and with very few casualties with some divisions registering under a thousand casualties. As the tanks moved forward they would lose their shock value and the German defenders would begin to regain their composure. This allowed them to properly direct artillery fire to begin disabling the tanks, which were quite vulnerable given their slow speed. Even though the attack began to slow down, it had still achieved impressive gains at light costs. Those who are Patreon supporters know that I am somewhat passionate in my belief that the cavalry on both sides gets a very bad, and undeserved wrap, from the war. And so I feel duty bound to mention that Cambrai, while a showcase of the future of war, would also feature some of the most successful British cavalry actions of the war. The cavalry would take part in the attack, and the British would also match them up with the new Whippet medium tanks, a combination that would end up being a failure due to how poorly they worked together. However, the cavalry by themselves did some good work, there were several actions were the cavalry was able to display how it could still be useful on an even moderately open battlefield. They were able to use their mobility to move machine guns around in ways that infantry simply could not, allowing them to get enfilade fire down on German positions, and to outflank German infantry units. There was nothing in these actions that was turning the tide of the battle, but they were effective in their own small way. If you want to hear me defend the cavalry of the war, there is about 2 hours of me doing just that for Patreon supporters. While the British made some gains ont eh 20th, and they thought they had done quite well, as usual their gains would soon be mostly wiped away. For 10 days after the attack the Germans waited, building up divisions which prepared for their counter attack. On November 20th this attack would be unleashed, with 20 German divisions moving forward early in the morning. By the end of the day the British were mostly back where they began on the 10th. About the only real gain that remained was the area that would come to be called the Flesquieres Salient which continued to jut out into the German lines. Remember that name, Flesquieres Salient, and how it was created, it will be extremely important in March 1918. While in the end the British gained very little territory, the British felt like they had initially accomplished something, it was considered a true victory. In England church bells rang all over the country to signal victory. Even though this would soon be erased, the battle would outlive its physical consequences. After the war it would be well studies for clues on the future of armored warfare, which turned out to be the future of war. With the end of the German counter attack at Cambrai the year on the Western Front was over. The year had seen the British and french throw everything they had into their attacks. One of them, on the Chemin des Dames, was a absolute failure. The other, at Passchendaele would be considered a failure, but you could find people who thought that it did accomplish the goal of capturing or killing Germans, which was about as important as anything. Beyond the lives lost and the territory that changed hands by the end of the year there were two critical pieces to the situation the Western Front caused by these actions that would shape the last year of the war. On the side of the Entente, their armies were exhausted. They had put everything into their 1916 and then 1917 and they would not be capable of similar efforts in 1918. All winter would be spent rebuilding and retraining just to be able to man the lines until the Americans began arriving in force in the middle of 1918. On the German side the bloody defense of 1916 and 1917 would convince many in the German high command, including Hindenburg and Ludendorff that such an arrangement could not continue. They had to do something, anything, to keep from just fighting the long defeat of bleeding to death against wave after wave of Allied attacks. This would be the root of the 1918 Spring Offensives. These offensive aspirations were buoyed by the fact that soon the Bolsheviks would lead Russia out of the war, and hundreds of thousands of German troops would soon be on their way west. This would setup for the climax of the war in 1918. 1914 had been the beginning, 1915 the year of Entente Failure and German success; 1916 was the year of the Attrition battles, 1917 the year of mutiny and revolution, 1918 would simply be the end.